OurDoctor physicians are available 24/7/365 and provide members with convenient, quality medical consultations via HIPAA complient secure video and or audio. Our physicians can diagnose many common conditions and recommend treatment plans including non-controlled prescription medication as necessary. OurDoctor.com wants to be the service to support you when you need to talk to a Physician or visit with them through an online video session. The use of Telemedicine services for a low cost is something that we wanted to share with anyone who would like to be treated remotely when you cannot reach your primary care physician or need a short-term prescription refill. 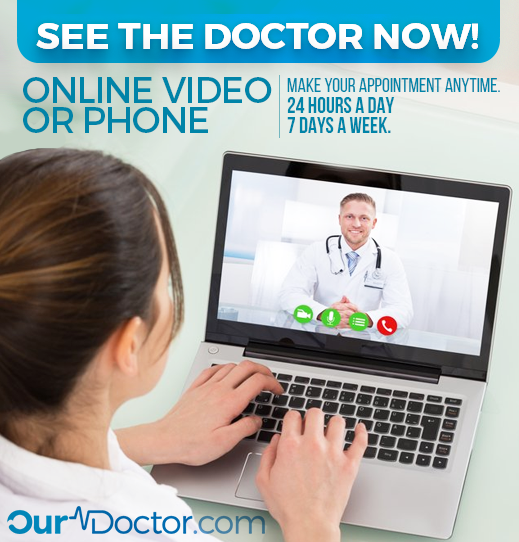 OurDoctor.com wants to be the service to support you when you need to talk on the phone to a Physician or visit with them through an online video session. Use OurDoctor if you want to ask general or specific questions about anything that may be affecting your Children’s health. Using the OurDoctor service really comes in handy when it is after normal Physician business hours or when you are on vacation or traveling away in or out of the Country. Many times you may not be sure if you need to go to an urgent care center or visit your local hospital’s Emergency Room for advice on a health related or non-emergency health issue. The few of the top reasons for using OurDoctor is that it costs less per month than the average health insurance co-pay. This service reduces healthcare costs by eliminating preliminary medical problems before they become chronic. The Physicians are available 24/7/365 so anytime you need to talk to a Doctor, you can. Physicians can diagnose, treat and prescribe medication when necessary. Prescriptions can be sent to any Pharmacy of your choice. OurDoctor supports Nationwide coverage to include Puerto Rico and there are also Spanish speaking Physicians available. All provider level Patient satisfaction is monitored and all Physicians are licensed and reside in the USA.